Do I need Pool Cove? http://megapoolandspa.com/stpufr.htmlsells several replacement swimming pool pumps for aboveground pools. The StaRite pool pumps for aboveground swimming pools come in several models. We sell 3/4, 1, and 1.5 horsepower versions. The 1hp pool pump is one of the more popular pool pumps, but it’s important to purchase the correct size pump needed with your pool. When you need a new swimming pool liner, visit Mega Pool and Spa ! We have cheap overlap swimming pool liners, beaded pool liners, and expandable pool liners. We carry the best patterns and tons of sizes from manufacturers like Swimline pool liners. If you need an Esther Williams pool liner, or a Doughboy pool liner, visit our site for a replacement liner from Swimline. At megapoolandspa.com , we carry a full line of swimming pool equipment and pool supplies. We always have the lowest prices on pool liners, but sometimes, we’ll email out coupon codes for additional savings. Signup at our site and we’ll update you about all our offers. While we have the cheapest swimming pool steps on the internet, you may save even more!! Put up an artifical Palm tree for the Christmas season! A lot of people buy an artificial Christmas tree, but look how great this is. Get a Palm Christmas Tree this year instead! www.megapoolandspa.com has a line of artificial Christmas Trees. These prelit Christmas trees are easy to assemble and look great. Please visit Mega Pool and Spa to see a full line of Christmas Trees. Easy Set-Up, no tools needed! Massaging Bubble System with 130 Air Jets! Completely portable – easily folds for storing or traveling! The word is out on the new Personal Home Saunas! 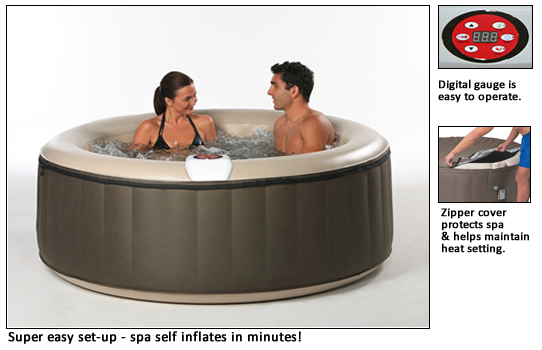 At www.megapoolandspa.com we have just brought in several models of home saunas. We have 1,2,3, and 4 person saunas. Choose from Ceramic or Carbon heaters. Start reaping the benefits of an Home Sauna today – look better, feel better, live better! HeatWave Saunas™ are the safe, effective and affordable way to relieve stress and improve health, right in the comfort of your own home. Our saunas utilize the latest in infrared heat technology, are super easy to assemble and fit in virtually any room in your home. With their Solid Hemlock Wood and tongue & groove construction, these saunas are built to last, providing you with years of health benefits and stress relief. HeatWave Saunas™ come with either Ceramic or Carbon heaters, feature interior reading lights and built in sound systems to further enhance your sauna experience. HeatWave Saunas™ operate on a safe 110v/15amp power and are backed by CETL certification. You are currently browsing the Mega Pool and Spa's Weblog blog archives for November, 2009.